Our second project in conjunction with Emma Jane Interiors that we are pleased to feature here in our Journal. This lovely family home in Broadstone has been brought back to life with the very talented eye of Emma Jane. 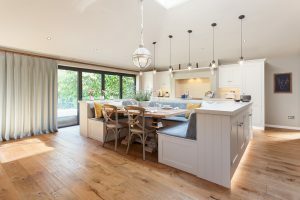 A stunning kitchen with plenty of natural light due to the wall-to-wall doors across the back of this superb kitchen extension. 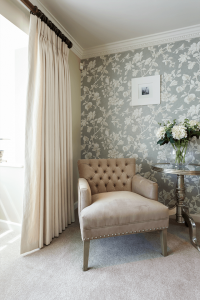 Broadstone clients contacted Emma Jane Interiors as they wanted professional advice for this fabulous new space that was being created, something they felt they would not be able to achieve alone. The space not only needed to be designed with a layout to suit their lifestyle, but equally be beautifully decorated and practical. 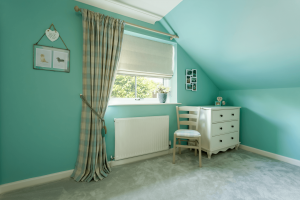 The entire ground floor of this home was refurbished and decorated to incorporate the united vibe of Emma’s style and colours she’s injected into this house. This large kitchen and living space have been cleverly divided into five prominent areas. The kitchen, the dining area, a snug, home office and a hidden utility room. The perfect area for everyday family life. Emma Jane has maximised the use of this space and incorporated a dining area inset within the units. Fixed upholstered seating allows up to 8 to sit comfortably and the 2 additional free-standing chairs inject some character and versatility at the table. 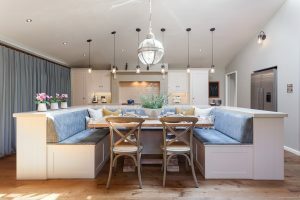 The fixed seating around the dining table is upholstered in an adorable Colefax blue weave, with scatter cushions to add comfort, colour and texture. The most fabulous, large chrome storm lamp that hangs above this section of the kitchen certainly is the crowning glory in this room. With a staggering 10 widths of Romo fabric, we’ve made one single curtain for these vast bi-fold doors. We accomplished this mammoth task with the expertise of our talented team. 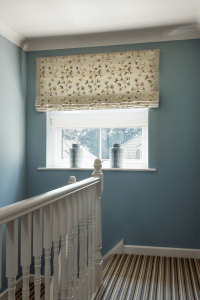 The curtain has been accompanied with an exclusively commissioned pole to span the entire width of the window, to ensure ease on closing yet also giving the aesthetics required. 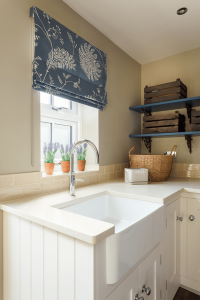 A utility room leading off the kitchen has a stunning roman blind in a gorgeous Sanderson fabric, in a vintage French blue with a white embroidered floral design. The clients loved this fabric so much they commissioned us to make several scatter cushions to complement the sofas in the snug. The entire colour palette is a blissful blend of blues, yellows and pale greens. Portraying traditional country style elements yet making the space modern and bright. 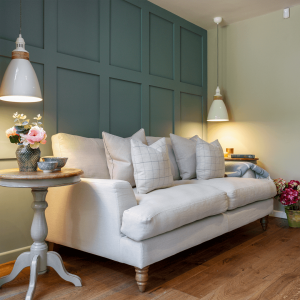 When it comes to the Boot-room/Cloakroom Emma Jane has commissioned a custom-built coat and storage unit with seating, cushioned in a James Brindley fabric. 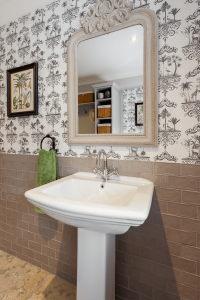 Colonial printed mono toned wallpaper by Cole & Son encapsulates the walls and gives a fun element to this room. A grand sitting room features another impressive piece of built-in wooden furniture. A wall unit painted in a gorgeous lead colour paint. The unit surround a wood burner, TV and displays some adorable and attractive accessories. 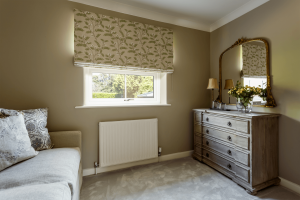 One feature wall has a Sanderson paper in grey and creams to offset the tones of this room and balances the presence of the wall unit perfectly. Curtains sit either end of this duel aspect sitting room, made in a Romo pale gold linen mix fabric and hung from chunky wooden pole. 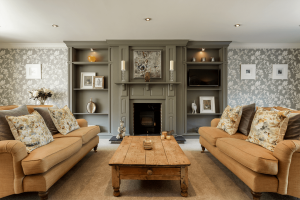 The colour palette of mustard gold, grey and ivory gives a sumptuous yet cosy atmosphere.